This week I am examining the experience of a woman who, as a teenager, was depressed and asked inwardly to die. She had a dream that had all the qualities of an angelic, out-of-body event. She was told to go back to her life because there was more she had to accomplish. (Scroll down to my last post.) I made the remark that this experience stands alone and need not be analyzed as a dream. * Hall: A connecting pathway. * High school: A place where you learn at about the mid-level. * Staircase: It’s where you can either ascend to a higher level, or return to a lower level. In my case, I was about to go down to the base level. * Deserted: It’s usually busy, but now I was by myself. * Intense, overwhelming, bright white light: It was otherworldly. The power was so far beyond me, it was beyond awesome. There was nothing to do but surrender. * Barely look at it: It was so intense it was almost intolerable. * Stunned and didn’t move: I was momentarily paralyzed in my surprise and awe. * Male voice, authoritative but kind: In those days, my understanding of God was that He was male. So It’s not surprising that God—or His representative—came to me in a male form. This was definitely God-like. * Beckoned me forward: It was asking me to enter into its interior space. * “Are you afraid?”: I think that was said just to snap me out of my momentary paralysis. 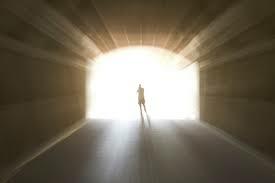 * I went forward into the light: I kind of became one with it—not in the sense of being as great as it was, but in the sense of immersing myself in its energy and power. * Being taught: I was receiving instruction and I was growing. * Wasn’t time to die: I had been wanting to quit, and it told me that I had more to do. * Great gifts to give the world: My suffering wasn’t useless. There would be benefits that I would be able to pass along. * The good of myself and the whole: I got the message that I was part of a much larger picture, one that I probably didn’t understand. It was reassuring. * Lying on my stomach: An unusual sleep posture for me. * Clawing the sheets: I knew that the weight of what I had to do was back on my shoulders after I had felt so light and free in my dream. I knew there was a price to pay, and I wasn’t happy about it. In many dreams the message of the interpretation is radically different than the un-interpreted dream. But not here. Stay tuned!